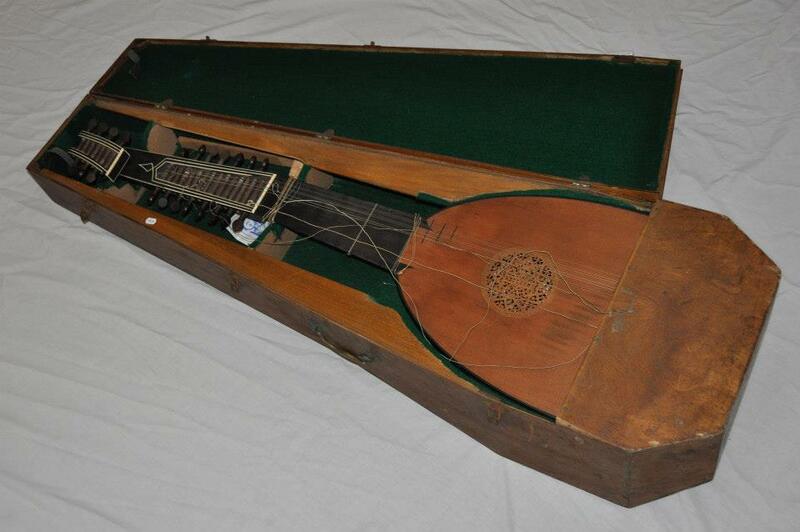 Results From The Dolmetsch Lute Auction — Gamut Music. Inc. It is not often that a significant lute becomes available on the open market, but such an event took place on Thursday, June 6 at 11:00AM local time in New Zealand. The instrument in question was a fourteen course instrument made by Arnold Dolmetch. The hand written label in the instrument reads: “This is the first lute made at Jesses, Haslemere, under my direction. 1917 Arnold Dolmetsch”. The instrument is in a wooden case that has a number of shipping labels on it including a label with Dianna Poulton’s name on it. There is little known about the instrument and how it got to New Zealand and the only information that the auction house had is that it was placed in a storage locker in 1993 in Wellington, New Zealand and the locker has been delinquent for a long time and the owners of the unit have sent the instrument to auction to recover some of the money owed on storage fees. This lute, being, apparently, the first one made at the Dolmetsch workshop in Haslemere makes it one of the first lutes made in the lute revival of the 20th century and therefore a touchstone for the lute culture that we now enjoy. It seemed important that this instrument be returned home to England and that it be made available for public view to be part of the historical record of the development of the lute revival in the 20th c. So, Dan, in his capacity as the President of the Lute Society of America, approached the Lute Society in England to see is there was any way to retrieve the instrument. As it turned out, the Horniman Museum in London was interested in the instrument, so the Lute Society and the Lute Society of America decided to pitch in and help. They made an appeal to members for donations to allow the Horniman Museum to purchase the instrument for its collection. The Lute Society of America was able to collect $3,260 and this, together with the money that the Lute Society raised, was enough to allow the Horniman Museum to make the purchase and pay for all of the permits, shipping, etc. to bring the instrument back to England. The instrument will now become part of the permanent collection and be on display so that all can see the origins of the lute in the 20th century. Thanks to everyone who worked to make this purchase possible. Pictures of the instrument can be found following this link. Posted on July 1, 2013 by Daniel Larson.